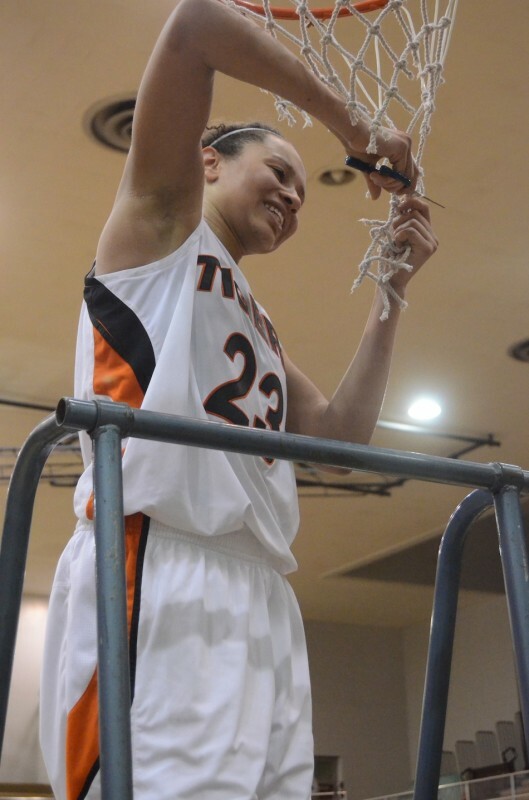 Jennifer Walker-Crawford gets her piece of the twine after leading Warsaw to a regional championship Saturday night at Valparaiso. VALPARAISO – It was only fitting that Jennifer Walker-Crawford cut down the biggest piece of the celebratory net Saturday night. The Warsaw senior had just finished cutting down Merrillville in the biggest performance in the biggest game of her high school basketball career. Everything about the silky smooth Walker-Crawford was big on this evening. Walker-Crawford led the way as Warsaw nipped Merrillville 42-41 in the heart-stopping title tilt of the Class 4-A Valparaiso Regional in true Hoosier Hysteria fashion. Walker-Crawford netted 19 points to go with 11 rebounds as the No. 8 Tigers topped the No. 5 Pirates to claim the program’s first regional championship since 2004. Warsaw, now 24-1, advances to play Fort Wayne South (23-3) in the one-game Northern Semistate next Saturday. The Tigers will host the contest with the starting time to be determined by the IHSAA on Sunday afternoon. South defeated No. 4 Logansport 71-55 in the title game of the Kokomo Regional Saturday night. The Archers beat No. 10 Westfield 57-56 in overtime in the regional semifinal. The Southern Semistate on Saturday in Class 4-A will pit No. 2 Bedford North-Lawrence (26-0) versus No. 6 Roncalli (23-3). The semi state winners will then meet March 2 for the Class 4-A state championship in the Hulman Center on the Indiana State University campus in Terre Haute. Nikki Grose heads for the hoop versus Merrillville. The junior had 13 points and 16 rebounds in a 42-41 win in the regional final. Nikki Grose turned in her second stellar effort of the day for Warsaw in the title game. The junior center had 13 points and 16 rebounds. Victoria Gaines, a 6-0 sophomore, paced the Pirates with 21 points and 10 rebounds. Senior guard Dariyan Morris added 10 points for Merrillville, which finish 23-2. Warsaw got the biggest play of the season from one of their smallest players. Senior guard Melanie Holladay, all 5-9 of her, grabbed an offensive rebound off a Walker-Crawford miss and calmly layer in back in with 20 seconds to play for the game winner. The Tigers then had to hold on for dear life in the final seconds. After a Merrillville timeout with 14 ticks left, Morris drove through traffic and misfired from close range. Grose grabbed the rebound and was fouled with 2.1 seconds to play. She then missed a free throw, but a desperation halfcourt heave by the Pirates was not even close. That set off a celebration that included plenty of screams of joy, hugs and tears from the Warsaw players. “We worked so hard to earn this,” said an emotional Walker-Crawford, who yelled “Big Piece” as she snipped the twine in the post game victory celebration. “It came down to heart and desire and we wanted it more than anyone in this gym tonight. I wanted this for my team so bad. We wanted to get home to play one more game. Holladay, whose rebound basket was her only shot attempt of the physical contest, could not recall much of the final play in the jubilant post game chaos on the court. Guard Eryn Leek of Warsaw looks to pass the ball in the regional title game Saturday night. Warsaw led 39-34 on a Grose basket with 3:04 to play. The Pirates used a 6-0 run to take a 40-39 lead with 1:11 left on a layup by Darian Patton off of a Morris steal. Walker-Crawford then hit the second of two free throws to tie it at 40-40 with 58.5 seconds remaining. Morris gave the Pirates the lead back at 41-40 by making the first of two free throw attempts with 40.4 seconds to play. That set the stage for Holladay to be the hero. “The girls kept their composure and poise and found a way to win,” said Warsaw coach Michelle Harter. “I challenged them at halftime to leave it all on the court and have no regrets and they responded. The seniors talked about this on Senior Night. It was their goal to get to play one more home game in the semi state. “The last thing I told them in the timeout was to believe in themselves, believe in the team and believe in our system. I just can’t say enough about the leadership of our seniors. Lindsay is our vocal leader, Jen leads by example and Mel does the little things. The Tigers came out slow versus the athletic and quick Pirates. Warsaw turned the ball over on its first possession of the game and trailed 11-4 early after an 8-0 Merrillville run. The Tigers then used their own 8-2 run to pull within 13-12 after the opening quarter. Merrillville led 19-17 at halftime as the Pirates shot 8-of-25 in the first half, while Warsaw was 6-of-28. The third quarter, as it has all season, belonged to Warsaw or more specifically to Walker-Crawford. 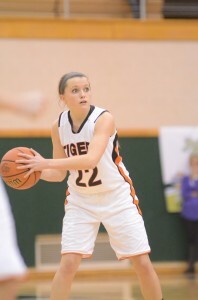 She scored nine points in the frame as the Tigers outscored the Pirates 13-8 to take a 30-27 lead into the fourth quarter. “We came out the second half and stopped playing scared,” Harter said of her veteran team. “The girls did a good job adjusting in the second half after probably our worst half offensively of the year. The girls slowed down and were patient. The third quarter has been tremendous all year for us. Lindsay Baker stares down a Merrillville defender in the regional title game Saturday night. Senior standout Lindsay Baker was just 1-of-11 shooting, including 0-of-6 on her specialty the 3-point shot, but still contributed plenty. The University of Toledo bound guard had four rebounds and team-high totals of five assists and three steals. “Sometimes the shots are not going to fall, but the great thing is that I don’t have to score,” said Baker, who like Walker-Crawford played all 32 minutes. “That’s what’s so nice about this team. There’s no pressure on me. Merrillville finished 15-of-48 from the field, including 0-of-13 from 3-point range. The Tigers were 15-of-46 from the field and 2-of-10 from deep. Walker-Crawford, who entered the game with seven triples this season, hit a pair from distance. 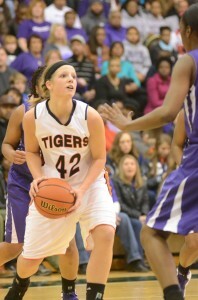 Holladay had four points, while Baker, Brooklyn Harrison and Sarah Ray each had two for the Tigers. Warsaw won its first girls basketball regional championship since 2004 Saturday night at Valparaiso. The No. 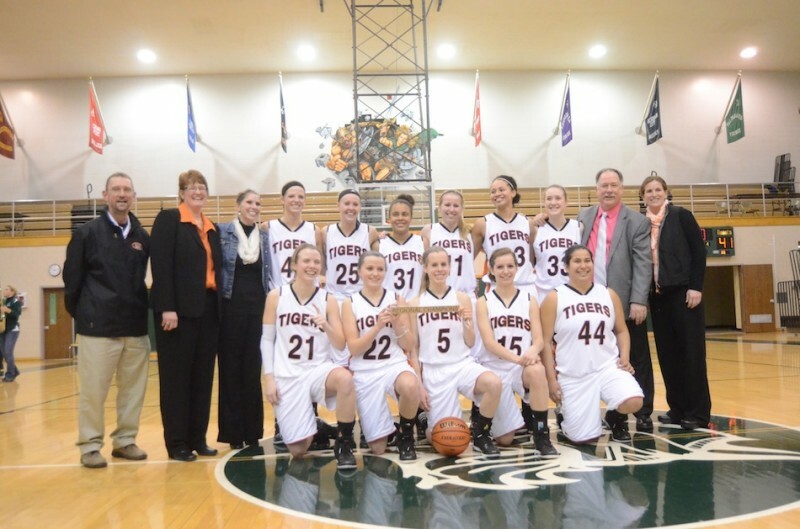 8 Tigers face Fort Wayne South in the Class 4-A Semistate Saturday.